"In the Gloaming" is a private, quiet and gentle filmed directed by the late Christopher Reeve. It is gorgeous in its simplicity and has a great deal to say. Here is one of those films that are not soon forgotten. A son spends his last months at home, in a wheelchair, as he dies of AIDS. In doing so he helps his family come to terms with his life and e brings his parents to an understanding of those unsaid things that caused them to drift apart over the previous years. The movie is short but in its brevity it expresses the deep, gentle love that is revealed during tragedy. All of the action revolves around the family's domestic routines and intimate conversations between mother and son who bask in the gloaming or the last hour of sunlight. The mother is played by Glenn Close and she is brilliant. Leonard, the son, is beautiful in his delicacy and as he fades, we all fade a bit. The movie is about mother and son and everyone else in the film takes a backseat to this. At the end of the story, the secondary characters rise to take their places in the story but only at the end. We know that there are family complications, especially when a family member s dying. What is compelling is the stoic and reserved nature of the response of the characters to the gay son's health crisis. Whoopi Goldberg turns in a good performance as the nurse teaches the mother to care, physically, for her son and to interact with him. The death scene is heart breaking and it gives a beautiful symbolic representation of as one life ends, another is reborn. The exploration of the family over a four month period as the prodigal son ails and dies is touching to the point of hurt. Danny, the dying son, as well as the other family members has constructed illusions of perfection so they do not have to face the pain of their isolated and lonely lives together. Only Danny is aware how everyone feels beneath their self-deceptions. His presence jars them to shirk the pretense and they fall away just as quickly as Danny's body loses strength. The unpleasant reality emerges that the gay son has returned home to die. The family is "perfect", save Danny. He has brought shame ad a sense of disgrace to them with his sexuality. Yet he is the only one who has lived his life openly and honestly. As he transitions to death, what has made him an outcast becomes the most profound and greatest gift his family will ever receive. He taught them self-sacrifice, non-judgment and unconditional love. The title comes from the time when Danny and his mother share their lives with each other in open and candid ways. During the gloaming things move more slowly and G-d's face is visible. It is then that they heal and become whole. Even though the son has AIDS, the movie is not about AIDS at all. It is a movie about going home and about healing. This movie is Reeve's legacy to us and it is a beautiful legacy that he left. He moves us and our souls leading us into the family and its troubled relationship. He has wrapped himself in this movie and then tied it with a bow and gave it to us. It's a beautiful gift. Based on the short story by the same name by Alice Elliott Dark that John Updike included in his collection of best short stories of the last century, no small achievement on the writer's part, IN THE GLOAMING is a near perfect movie about hard topics: missed opportunities, what happens to families who do not talk about important subjects, family dynamics that do not improve with time, the never-ending need to be accepted by your parents and homophobia-- in this instance in an upper middleclass family. 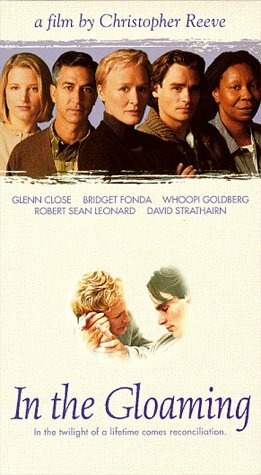 In this 60 minute long HBO production-- the story is so sad that the viewer's tear ducts are about emptied out by the end of the movie-- Danny (Robert Sean Leonard) is a young man with AIDS who has come home from San Francisco to die. The details of the movie are not new. His story-- or at least parts of it-- is the same as that of literally thousands of young men in the United States under the cocktail became available in the mid-nineties that turned people's lives around within days. His lover Paul could not cope with Danny's diagnosis and bailed out. Danny's sister (Bridget Fonda) does not bring her young son to see Danny and tells her mother (Glenn Close) that she will not raise her son by getting too close to him as Close raised her son, therefore making sure that her son does not become a homosexual. Shouldn't this woman be told that we are fairly sure now that the world is not flat? Whoopi Goldberg as Danny's nurse exudes warmth and love. I suspect she is playing herself since she has been involved in the AIDS fight from the beginning. David Strathairn as Danny's father Martin is the saddest of characters. It is impossible for him to get inside Danny's head and heart so he plants tomatoes, plays golf, attempts to take his wife on a trip to Italy. No father should have to utter these words on the death of a child: "please tell me what my boy liked." Glenn Close (Janet) comes to grips with mistakes she has made in the past-- she never invited Paul and Danny to Thanksgiving, Danny's favorite holiday as she now learns ("I thought you were too busy with your own life")-- and never discussed anything about Danny's life in San Francisco. Now she wants to know: "Did you love and were you loved in return?" She admits under questioning from Danny that while she was once wildly in love with his father that marriage for her seems liked something you endure. One wonders if this marriage will survive after Danny's death. The title of this movie is so beautiful, the gloaming, that time at twilight between day and evening when the world is peaceful and beautiful. Danny and his mother spend many evenings in the yard in the gloaming, which is of course symbolic of Danny's own life as his days are numbered. The action takes places from August to November as the leaves turn and autumn turns the green to gold. Read the actual short story. In the Gloaming is about a man dying of AIDS returning home to spend time with his family for presumably the last time. I'm sure most people know that it's coming, but the movie is still such a great emotional and dramatic ride that reflects on life and all of the greatest memories of it, and you will still cry when the time finally comes.